Forget Q1's lousy GDP. This week has the makings of a celebration of positive economic news. The Dow Jones Industrial Average (DJINDICES:^DJI) was down 18 points at 1 p.m. EDT Monday . With the Independence Day holiday coming up Friday, many expect this week to be about as slow and uneventful as it gets on Wall Street. Those people could be dead wrong. Why? Because this week we will see a slew of new economic data that could prove that the first quarter's shocking 2.9% GDP decline was an anomaly and that the economy is churning ahead at full speed. It's already starting. The National Association of Realtors reported this morning that its seasonally adjusted index of existing-home sales jumped 6.1% in May. This is the largest jump in the index since the first-time homebuyer tax credit expired in April 2010. On the news, the Dow abruptly erased early losses and the Nasdaq (NASDAQINDEX:^IXIC) jumped to a 14-year high. On Tuesday, the markets will receive reports on manufacturing and auto sales. The Bureau of Labor Statistics is then on Thursday due to release its "Employment Situation" report for June. The U.S. labor market has shown steady gains in the neighborhood of 200,000 jobs added per month since 2011. While most economists would understandably hope for stronger gains, this slow and steady improvement is far better than the status quo of 2008 and 2009. It is possible that in the aftermath of the first quarter's ugly GDP performance, a pullback on hiring in June could cause a temporary hiccup in the labor market recovery. Early indications are that this likely did not happen. The unemployment rate declined through the winter and spring, hardly skipping a beat as the country bundled up for the unusually cold weather. The four months ending in May each saw more than 200,000 new jobs added, which is the first time four consecutive months have seen that level of job growth since 1999. Last week, the Labor Department reported that weekly initial applications for unemployment insurance declined to a seasonally adjusted 312,000. This metric has fallen 9% since the beginning of the year. Two weeks ago, the total number of people receiving unemployment fell to a six-year low. 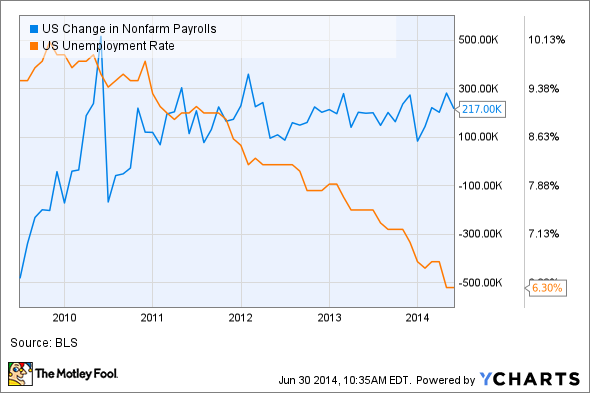 All these data points taken together strongly indicate that jobs data will continue to improve in June. So while Wall Street may be taking a vacation this week, a big jobs report on Thursday could be exactly the fireworks the market needs to break through to new highs. Who knows, we may all be celebrating a Dow 17,000 before the trading week is done.